We've got a big game coming up and I just had to share my latest game day outfit inspired by Fall! 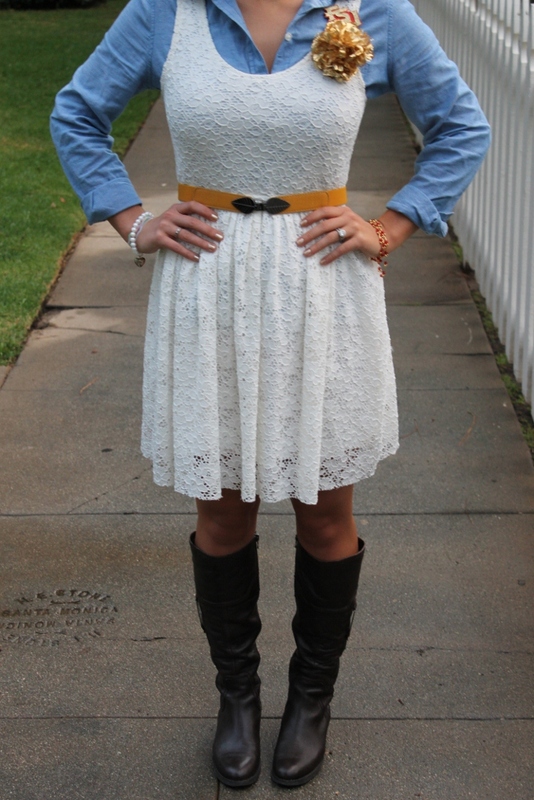 This is one of my favorite dresses from Twelve Saturdays - mostly because it's so versatile. It was a summer staple in my wardrobe but now I'm thinking up ways to transition into the cooler months. 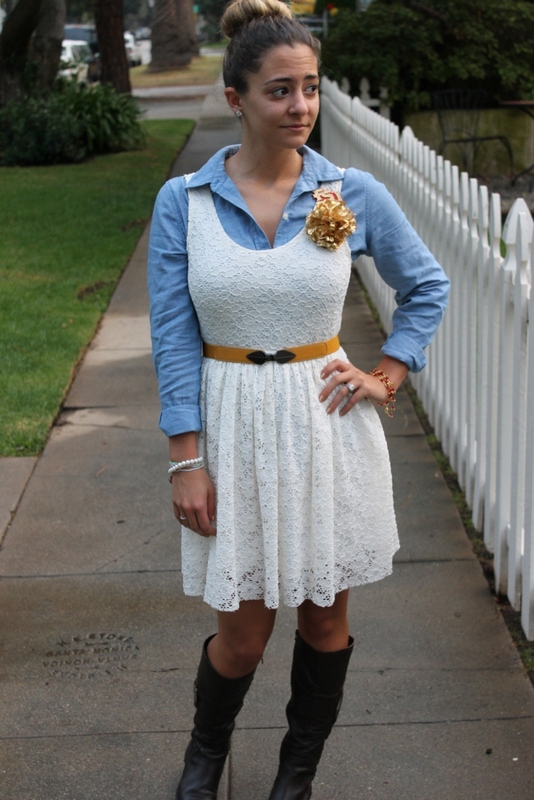 Enter the ever faithful chambray shirt & riding boot! I wrapped the arrow-leaf belt around my waist for just the right amount of Game Day flair - but could easily work for any alma mater with a pop of your school's color in a belt, sweater, top, brooch etc! Can we also talk about the amazing metallic & glitter happening near my shoulder? 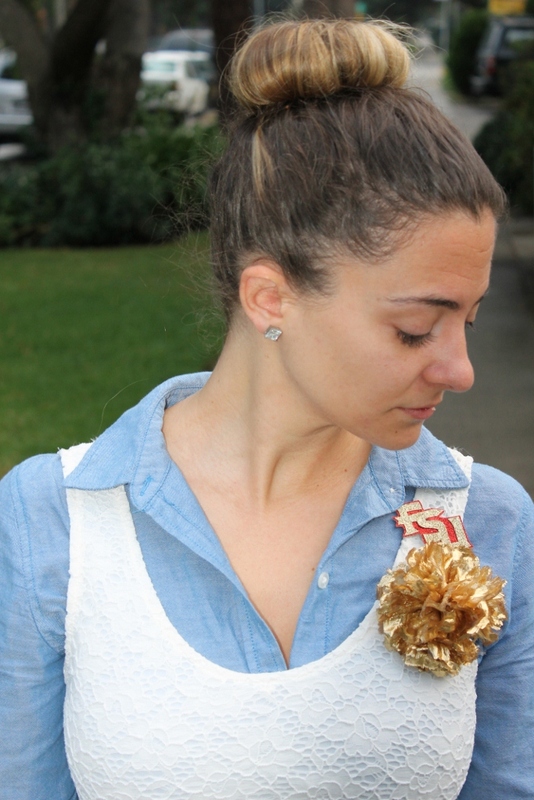 The metallic pom pom flower from ban.do's Holiday line (blogged about here) is the perfect Florida State Gold accessory. I couldn't resist Last month, I discovered an awesome Etsy shop, called Team Time, run by a super sweet gal named Janelle. She hand makes everything in her store and will even do special orders for your local team! 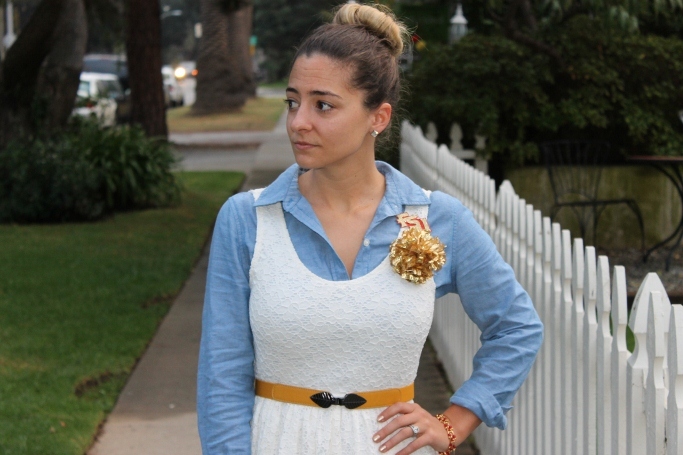 You guys have got to check her out - I just love this new headband she added recently. Hey, have you guys "Liked" BAD on Facebook yet? I'd like to try and hit a goal of 300 Likes before December 8th. Do you think you could help me out with that? 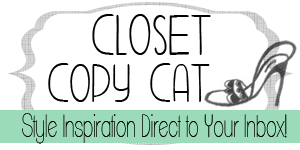 Double points if you like from your personal page AND your blog's page. Plus, I'd love to check out yours too! Happy Thursday everyone! What a great look! And it was a good game against you guys last night...we faired much better than I thought we would against the 'noles! Thanks for stopping by and i liked you on Facebook! Great look on you. I love the top knot too!